This letter is written in support of our wedding coordinator Liz Narez-Chacon, to which we give the highest recommendation! My husband and I are busy professionals, with little time to plan for a wedding. When we first met Steve, we were impressed by his organization and attention to detail. His wife, Liz, was there; and we felt like they truly cared. After one meeting with him, we felt like he had done more for us than our wedding planner! We finally started to feel at ease, and like we were making progress on planning our event. Then we learned that his wife, Liz, is a wedding planner! This was an invaluable decision! Liz is also exceptionally organized. She is reliable and efficient. As any future bride knows, there are a myriad of details that go into planning your day. Liz was on top of it all. She had a solution to all my concerns. For example, when I couldn’t find someone to do my hair and make-up, she referred me to her niece Nicolle and her friend Nancy. They came to my home and did a trial- and again, I was impressed! We hired them for our wedding and they were able to accommodate 5 bridesmaids, my mother and mother-in-law, as well as myself. They did a professional and great job. I had the utmost confidence in Liz. She is extremely conscientious, dependable, and prepared. She exceeded my expectations. Our wedding was seamless. My mother described it as “prefect and flawless.” My sister described it as “no stress.” There is not much more a bride can ask for! What impressed us about Steve and Liz is that they did not pressure us to sign a contract on our first meeting. He asked us for a wish list and then provided a Proposal that my wife and I were able to review and make a decision without the pressure. At our first meeting, they gave a presentation that actually opened our eyes on things we did not even think about that was needed at our reception..
Liz was our Wedding Consultant and she also officiated our wedding. The Ceremony was personalized and reflected us. Her script touched people in a way that there were tears in the eyes of people that we least expected. Our vision for our wedding was for our guests to have fun and not be bored. They did just that. Steve gave us a Grand Entrance that represented us. The introductions to all the special dances and events reflected our personality. We wanted un-traditional and that is exactly what we got. We also hired their photo booth; they customized our template by incorporating our engagement picture in it. I highly recommend that you get the scrapbook service. It was so much fun to be able to see all the pictures of our guests having fun and reading the great messages, something we will treasure forever. I really wanted a monogram but did not know that it was going to work out because the Venue did not have a lot of wall space, however, Steve found the perfect spot over our Sweetheart table. Also, there were so many intimate touches, my Mom passed a year ago and they honored her memory in a beautiful subtle way that was very touching. Steve and Liz are great! They are timely, responsive, affordable and very easy to work with. What more can you ask for!? In addition to DJ they offer a wide range of other services. I used them for lighting at my wedding as well and everything turned out great. Steve made sure everything flowed smoothly and kept the party going! I would totally recommend them to anyone...IMPDJ is awesome! We loved our DJ! 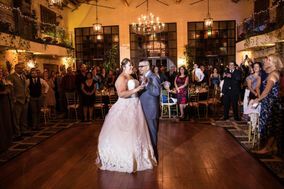 My husband and I are not big party people, but we told them what kind of music we did like and that we wanted music people would dance to and they played great music everyone was really happy with! When someone requested a song, they said the DJ's quickly found the song and played it. I highly recommend this company. We used IMP for our reception lighting. Steve did a great job. He was able to create the atmosphere we were looking for. He arrived and set up on time. He designed our custom gobo with our names and that turned out beautiful. It was definately a good touch to the reception decor. We also hired Steve's wife "Liz" which does day of coordination. She was wonderful. She did exactly as we had asked. Was there early and didn't leave until the reception ended and she packed everything up for us and had it ready to load in the car. I especially liked the fact that she does not only work with you the day of, but she starts at least two weeks prior with your arrangements. She was very fairly priced; not like those other coordinators that charge and arm and a leg for this type of service. Both Steve and Liz were a pleasure to work with and I would definately recommend them. Steve and his wife were excellent. They were very organized as to how the reception would be scheduled and helped us along every step of the way to create a great party for our family and friends!!! Their music selection was extensive and the quality of the music was great. We loved how they accommodated us with some of the mood/background music we were hoping to have while people were eating their dinner.